This mild spicy rice has an addition of colourful and healthy spinach & corn in it. 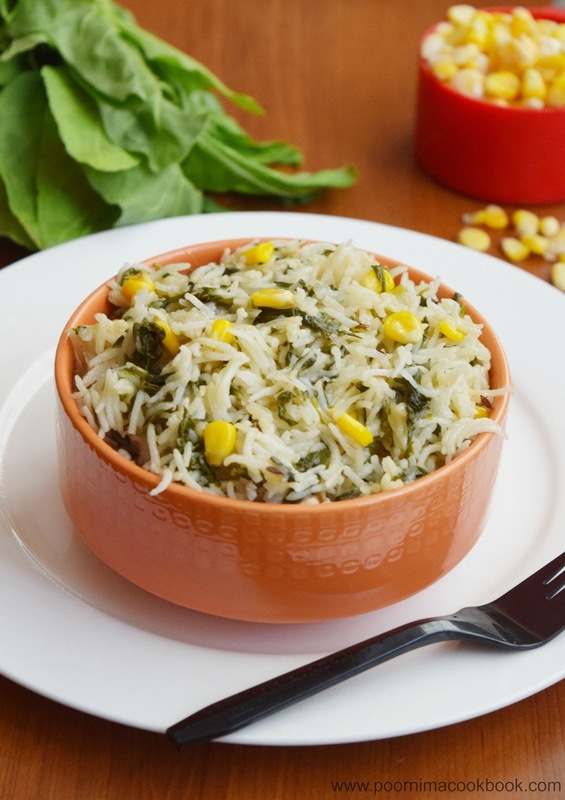 Spinach & corn helps to increase the nutritive of value of this dish; perfect for lunch box and parties. 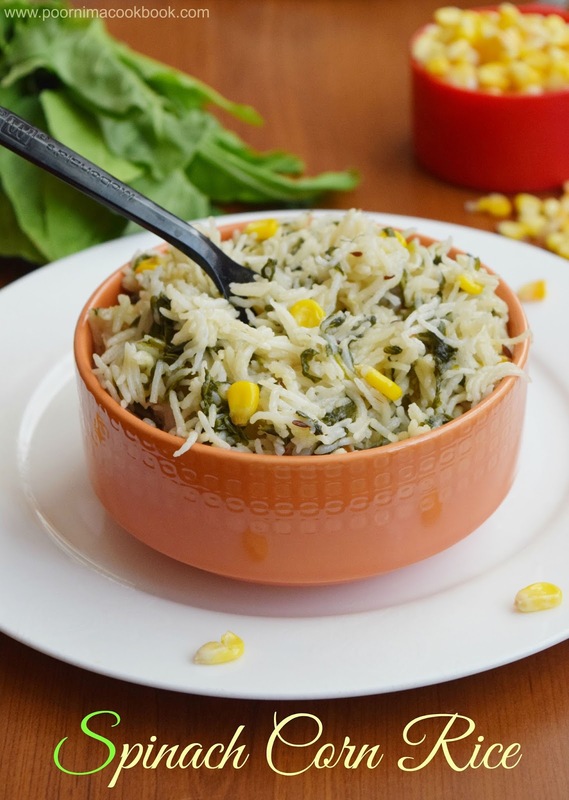 Try out this recipe; I am sure you will like this! Keep all the chopped ingredients ready. Wash and soak the rice in water for nearly ½ an hour. In a pressure cooker, add oil and ghee; after it becomes hot, add bay leaf and season it with cinnamon and cumin seeds. Once it crackles; onions and green chillies. Stir well till it becomes translucent. Once it is done, add chopped spinach, corn and salt. Stir well and add the drained rice; give it a mix. Add 3 cups of water and give a gentle mix. When the water starts boiling, check for salt. Close the cooker with the lid. After the first whistle simmer for five minutes and switch off the gas. Serve hot with raita / pickle / any curry and Enjoy! 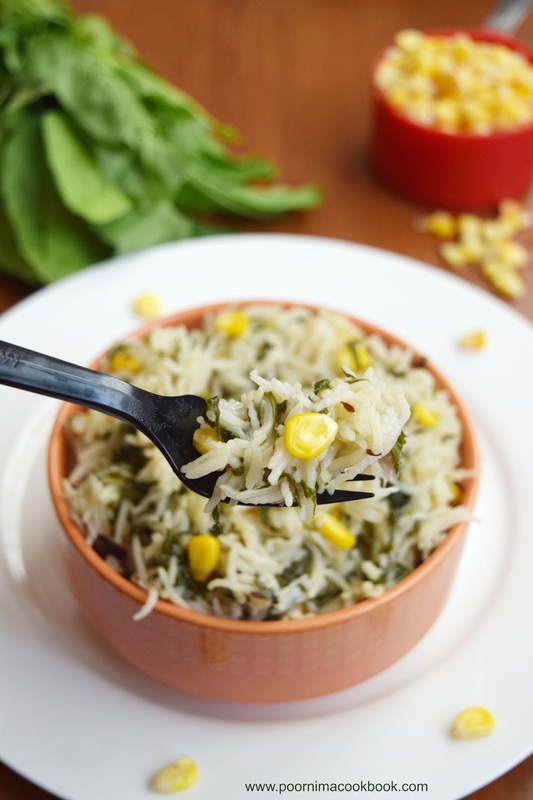 You can also omit green chilli and use only red chilli powder for spice. Amount of water will vary according to variety or quality of rice.